In this issue: A stand for liberty, a mythical city falls, and a new Honor Harrington comic book! In 1781, George Washington loses at Yorktown—and is later executed. The British heel strikes down. Hard. But on the edge of the American frontier a hope and dream for freedom lives on. 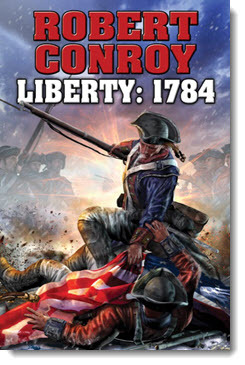 They call the colony Liberty, and the British intend to crush it as they did the rebellion. But these Americans are seasoned warriors and even under these dire circumstances, Liberty may still find a way! After the collapse of the galactic web, civilization crumbles. On Bellevue, a computer named Center survives. Center’s task: rebuild galactic civilization. Center’s tool: a young general named Raj Whitehall. Raj has almost accomplished this momentous task, but the half-mad jealousy of his emperor is about to undo all. His only choice: revolt! Contains the General series novels The Anvil and The Steel. Honor Harrington: Coming to a Comic App Near You! Big things are in store for Honor Harrington. David Weber’s best-selling book series becomes multi-platform entertainment with a comic, mobile game, film and more. It all kicks off March 5th with the first issue of Tales of Honor, a five-part comic based on Weber’s On Basilisk Station. Click here to download a free preview of the first issue, buy the comic, and watch a video on the adaption process. And stay tuned for more exiting Honor Harrington media news! Want to show off your treecat pride? How about just being able to distinguish your Royal Manticoran Navy warship from all the others in the orbital parking lot? The solution: bumper stickers, of course! We want to hear your ideas for RMN bumper sticker slogans. These bumper stickers should be suitable for affixing to your RMN warship. “Do It With Honor” and “I Brake for Treecats” are taken, but anything else is fair game. Fascinating conversations with your favorite Baen writers about the books you love. Interviews with David Weber, Eric Flint, Larry Correia, David Drake, Sharon Lee & Steve Miller, Tom Kratman, and many more. 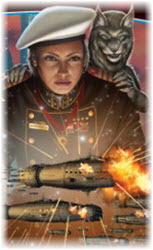 Plus coming soon: audio drama adaptations of your favorite Baen authors! Baen Books congratulates Charles E. Gannon on Fire with Fire, a Nebula Award finalist for best science fiction novel. Way to go, Chuck Gannon! 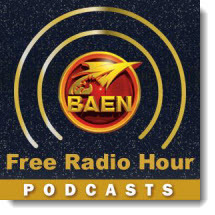 Check out the Baen Free Radio Hour interview with Chuck here and interviews here and here. When the British win the American Revolutionary War, desperate patriots must make a last stand in the rebel stronghold known as Liberty. Raj Whitehall has come close to reuniting the entire planet of Bellevue and has set the planet back on the road leading to the stars. But the half-mad jealousy and fear of Emperor Clerett is about to give Raj no choice but to revolt or face death and the loss of all he has gained for freedom. A wounded Atlantean prince, a deadly battle between Dark and Light, and aristocratic sisters trapped in a web of deadly sorcery—the same forbidden sorcery that could bring about The Fall of Atlantis. Brings together Web of Light and Web of Darkness in one volume. As the Solarian League collapses, rebellion brews. Success for Honor Harrington’s Star Kingdom against the League has bred dangerous times. While freedom for millions hangs in the balance, one false step could lead to a final disastrous conflagration. The kompani: a culture based in dance and dream. 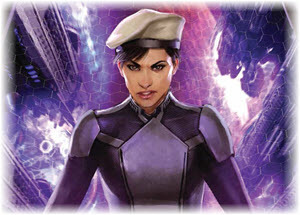 Clan Korval: star traders wealthy in enemies, fortunate in friends. Now the lives of three people intersect—Kezzi, apprentice to the kompani's grandmother; Syl Vor, Clan Korval's youngest warrior; and Rys, a man without a world, or a past. The Liaden Universe® saga continues. 2105: Cryocelled investigative reporter Caine Riordan awakens to a changed world where humanity has achieved faster-than-light travel and is pioneering nearby star systems. Riordan’s mission: travel to a newly settled world and investigate whether a primitive local species was once sentient–enough so to have built a lost civilization. Nebula Finalist. Don't forget to check out the newest ebook releases here, plus Baen.com free fiction from Robert Conroy here and William Ledbetter here. Also, don’t miss the monthly free nonfiction, article, “Dungeons and Dragons” here, and part five of a series by Tom Kratman, “Training for War,” here.